Insulated sleeping pads are made for backpacking in three seasons. We put these ultralight sleeping pads to test over the course of a wet spring on Vancouver Island. They were tested on a variety of surfaces, temperatures, and trips and compared them based on ease of use, comfort, durability, warmth and weight to create an overall Gear Institute rating. The most comfortable sleeping pad reviewed was the Big Agnes Q-Core. Its offset baffles create multidirectional comfort that creates a firm but supportive pad. Regardless of being a side or back sleeper, the Q-Core offered enough stability in either position. 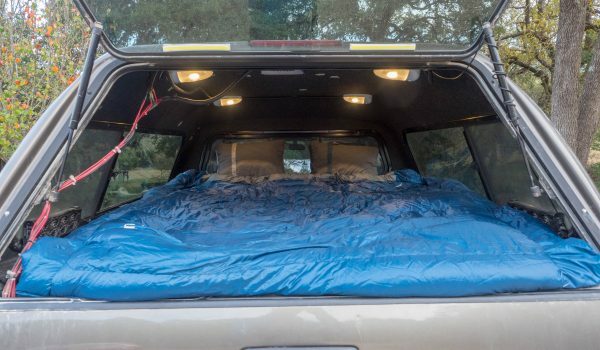 The 3.5 inch thickness ensures sleeper’s hips keep far off the ground – a backcountry luxury. The least comfortable is the Sea to Summit Ultralight Insulated pad due to only a two inch thickness and the “Air Sprung Cells” that create the feeling that the pad is even thinner. The lightest (and most packable) mat in the review is the Therm-a-Rest NeoAir, which weighs in at 11.8 ounces and packs smaller than a Nalgene bottle. The Therm-a-Rest has foil-lined insulation which allows it to be much more compressible than the synthetic insulated pads in this comparison. The heaviest pad is the Nemo Astro Lite 20R, which weighs 19.3 ounces, due to its thick layer of synthetic insulation. Both the Sea to Summit Ultralight and the Big Agnes Q-Core have a Denier rating of 40. Denier is the weight of the fabric (or thickness of thread used). Both of these pads held up to rough, rocky ground and a two-knee kneeling test. They held up well with no fabric pulls or punctures throughout a season of rough testing use. Warmth is compared by a sleeping pad’s R value. The warmest rating in the test of 4.5 came with the Big Agnes Q-Core SLX. Despite being only rated as a three season pad, the Q-Core SLX kept the tester completely warm even during a spring snow. The thickness of the pad contributes to the warmth, as it keeps the user further from the ground. The pad is insulated by Big Agnes’s branded synthetic insulation, Xstatic. The pad with the lowest R value rating is the Sea-to-Summit Ultralight Insulated Mat, with a value of 3.3. The thin pad means sleeping closer to the cold ground. Inflating and deflating sleeping pads become easier with an efficient valve and a pump bag. The easiest pad to use was the Exped Synmat Hyperlite M because of its two-way valve that provided a quick deflate and rolled easily back into the original bag. Exped’s pumpbag was an extremely efficient way to fill the pad without expending any energy or delivering unnecessary moisture into the pad. Upon testing the five pads in the ultralight insulated sleeping pad category, it was clear that the Big Agnes Q-Core SLX stood out above others – especially for comfort, durability and warmth. As technology advances, companies are getting better at creating lighter pads that deliver impressive warmth to weight ratios. Although lightweight sleeping pads have been around for years, the pads have become lighter, pack smaller, are more durable, and are easier to use. 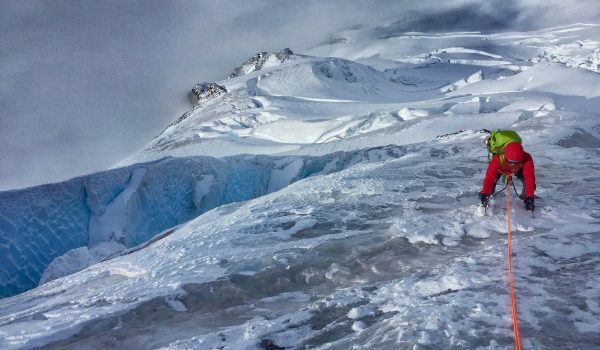 Outdoor brands either have their own insulation type that they have developed, such as Big Agnes’s Xstatic synthetic insulation or, like Nemo, they use already established brand’s such as PrimaLoft. No major differences were apparent in direct comparison as both deliver similar R values. Another improvement is the durability of the fabric. The pads are getting lighter without compromising the durability and integrity of the design. After testing five pads, all with varying baffle construction, it is apparent that the forward thinking brands such as Big Agnes and Sea to Summit are moving the right direction by constructing pads with multidirectional comfort without compromising weight. However, Sea to Summit may have a ways to go until comfort is maximized with their dimpled Air Sprung Cells. When testing sleeping pads, it is important to consider the features of the mattress while removing personal preference as well as environmental variables. Temperature, precipitation, and the type of ground the testers were sleeping on are all factors that can remove consistency in testing. To create a controlled testing method, the rating and testing system was based on the following testing grounds: Comfort, Durability, Weight, Ease-of-Use and Warmth. This set of criteria was chosen and tested based on the fact that these are pieces of criteria that separate a traditional blue foamie to a $150 insulated mat. Comfort was the most challenging category to unbiasedly rate, as this can be based on personal preference of firmness and the type of sleeper (side, back or front), and preference of having a narrow foot or not. The tester chose to largely base this rating off of the R value rating and true result of each pad. Durability can be measured by the Denier rating of the fabric. This was taken in consideration when creating a durability rating for each pad. The tester also established a method of testing each pad by using a kneel test as well as trying the pads on multiple tough surfaces to determine how the fabric responded to abrasion. Weight is easily measurable by using an accurate scale and testing in comparison to the brand’s claimed weight. Ease-of-use is a bonus in any piece of gear, not just sleeping pads. These additional features are often what make a product go from good to great. For sleeping pads, ease-of-use is mainly factored by inflation and deflation time, which directly relates to the type of valve used. Testing ease-of-use was done by timing inflation and deflation time. R value is a rating system based on the thermal resistance of insulation. The higher the R value, the greater the effectiveness of its insulation. Other than taking the R-value into consideration when determining a Warmth rating while testing, a consistent temperature controlled area can help determine the effectiveness of the air cells, baffles and insulation. Generally, if the mat is too thin the air chambers cannot provide enough space to insulate and the chill of the ground can be felt. 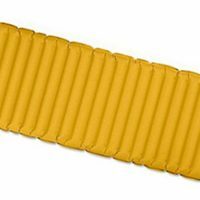 Insulated sleeping pads are built with various fill types that contribute to their warmth: synthetic insulation, down or using reflective materials like foil. Synthetic insulation can add to the weight, but is more suitable for three season use and can be a more cost effective option compared to down. Synthetic pads are typically used more as a three season pad as their comfort rating is limited to what the synthetic insulation can deliver as an R rating. 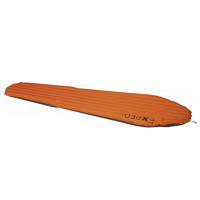 The criteria for rating ultralight sleeping pads is: weight, comfort, warmth, durability and ease-of-use. After a season of testing the variety of five pads, it was clear that certain features beyond the obvious brought a sleeping pad from good to great. It is extra features and comfort that really sets a pad apart from the rest. Companies are using technological advances and their competitive edge to innovate sleeping pads that are lighter, with more durable fabric, and design features that create a luxurious comfort you consider using even at home. A limiting factor of ultralight sleeping pads is their price point. Pricing in this test ranges between $129-$159 for the standard size pad. A far cry from Therm-a-Rest’s original Zlite closed cell pad that is $45. However, with innovation and comfort comes a cost. Therm-a-Rest still produces their Zlite, albeit, modernized. Back in the 1970’s the innovation of having a controlled closed chambered pad was an advancement that was a tipping point for outdoor enthusiasts. This design has initialized a trajectory of advancements that have eventually resulted in Therm-a-Rest’s NeoAir and of course other brands’ comparative ultralight pads. Denier: A measurement and rating system that determines the fiber thickness of the fabric. A high denier is heavier and not as soft, but results in a more durable material. R rating: A rating system based on the thermal resistance of insulation. The higher the R value, the greater the effectiveness of insulation. Ultralight insulated three season pads typically have an R-value rating between 3 and 4.5. Baffles: The design feature of the pad that limits the movement of air by creating chambers. 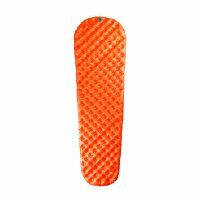 In sleeping pads, baffle construction can be a major differing factor that affects the overall comfort; lateral, vertical, quilted and offset are all baffle types that can be seen in this category of pads. Synthetic insulation: In this comparison, all pads have synthetic, essentially threads of plastic, insulation. This man-made insulation is not affected by water whereas down (yes, there are down insulated sleeping pads) will clump. Although new down coating technologies are starting to change that. The limiting factors of synthetic insulation are that it is not as compressible and is heavier than down.